Be the first to share your favorite memory, photo or story of Phillip "Doug". This memorial page is dedicated for family, friends and future generations to celebrate the life of their loved one. 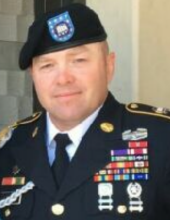 1st Sargent Phillip Douglas “Doug” Lawson, of the United States Army, passed away in Ft. Stewart Georgia on Nov. 27, 2018. He was born on Jan. 29, 1974, in Corbin Kentucky to Phillip and Rosemary Lawson. Sgt. Lawson has actively served his country for 16 years. He was deployed five times, having served in Germany in 2004, Iraq in 2006, Afghanistan in 2014, Germany and Poland in 2016 and Korea in 2018. He is survived by wife, Daniela Lawson, 2 sons, Kevin and Kyle Lawson, all of Elgin SC; his parents, Phillip and Rosemary Lawson of Emlyn; 2 sisters, Sonya Meadors, and husband Onnie, of Williamsburg and Sandra Teague, and husband Anthony Inman, of Emlyn ; 5 nieces, Jessica Thomas, and husband Guston, Heather Shirley, and husband Caleb, Sara Meadors, Crystal Teague and Kayla Teague, nephew, Adam Teague, and fiancée Becca Owens; one great niece and four great nephews; along with several aunts, uncles, cousins and many friends that mourn his passing. He was laid to rest in Fort Jackson, South Carolina. Visitation will be from 5:00 P.M. until the funeral hour on Monday, December 17, 2018 at Croley Funeral Home. The Funeral Service will be held at 7:00 P.M. Monday, December 17, 2018 at the Croley Funeral Home Chapel with Rev. Chuck Evans officiating. To send flowers or a remembrance gift to the family of Phillip "Doug" Douglas Lawson, please visit our Tribute Store. "Email Address" would like to share the life celebration of Phillip "Doug" Douglas Lawson. Click on the "link" to go to share a favorite memory or leave a condolence message for the family.